The nice folks at Friends of Hagerman National Wildlife Refuge Nature Photo Club recently invited me up to the Visitor Center to give a little talk about Urban Wildlife. I was excited to accept! This would be my first trip to Hagerman and I was eager to go. After my presentation, photo club member Ron Varley volunteered to show me around the park. We did a quick tour by car, but it was more than enough to give me the lay of the land. I came away with a good sense of the places I would like to explore more thoroughly on return trips. I was struck by the unique topography in Hagerman. Many of the marshy areas near the lake reminded me of places I have visited along the Texas Gulf Coast. Oil production is an important aspect of the refuge. Pumping stations are plentiful throughout, but somehow they distract very little from the natural appeal of this place. In someways they may even contribute through the unique habitats created as a byproduct of their installation. As we drove around, Ron pointed out areas and trails he thought I might be interested in. He filled me in on recent efforts to develop improved accommodations in the park. We discussed the varied wildlife that calls the refuge home. Of great interest were the stories about the huge flocks of Snow Geese that overwinter at Hagerman. Expansive fields of wheat are planted each season for the expressed purpose of keeping the geese well fed and returning year after year. 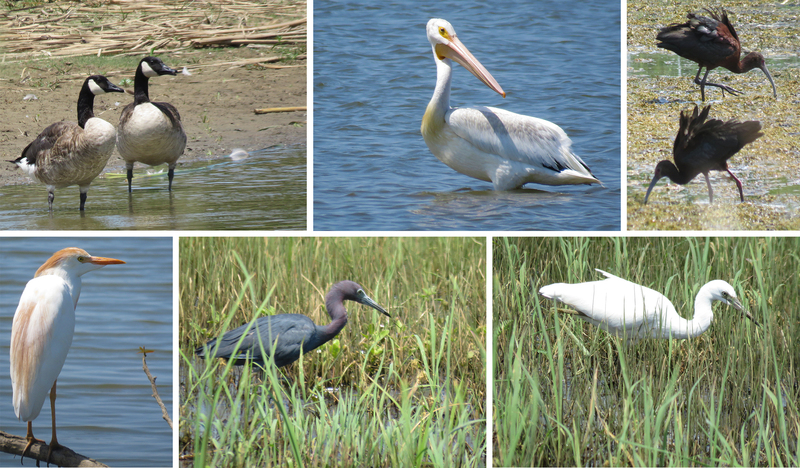 Clockwise: Canada Geese, a rare summertime American White Pelican, White-faced Ibis, Cattle Egret, adult Little Blue Heron, and juvenile Little Blue Heron. 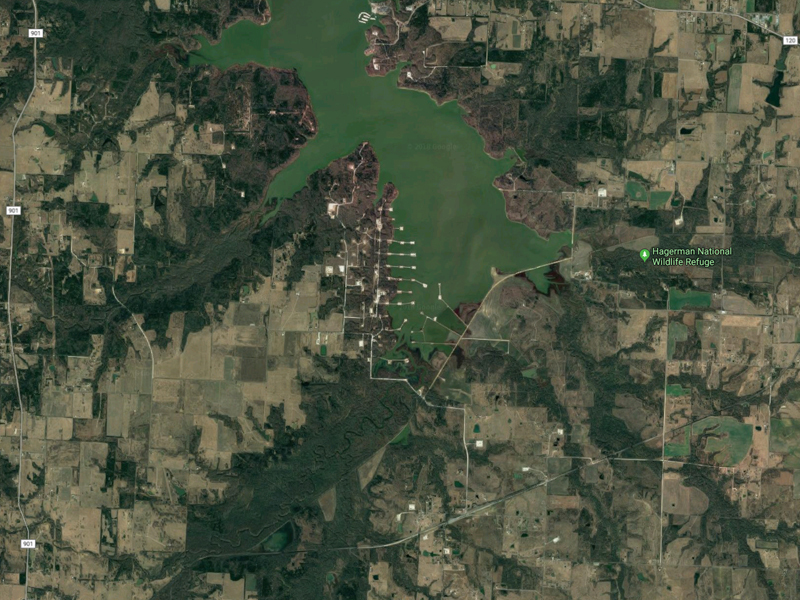 Hagerman National Wildlife Refuge sits on the Texas side of Lake Texoma, just a few miles west of Sherman/Denison. 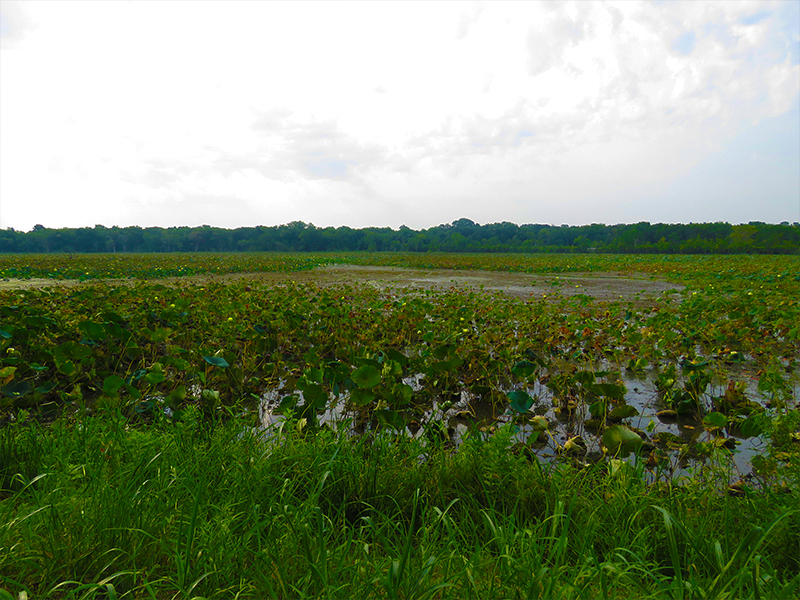 The park consists of 11,000 plus acres of mixed wetlands, bottomlands, uplands, and cropland. A satellite view of Hagerman. Notice the network of pumping stations and man-made peninsulas. 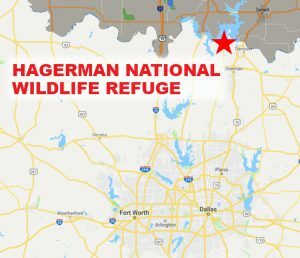 Hagerman is located just outside the normal coverage area for DFW Urban Wildlife, such that it is. 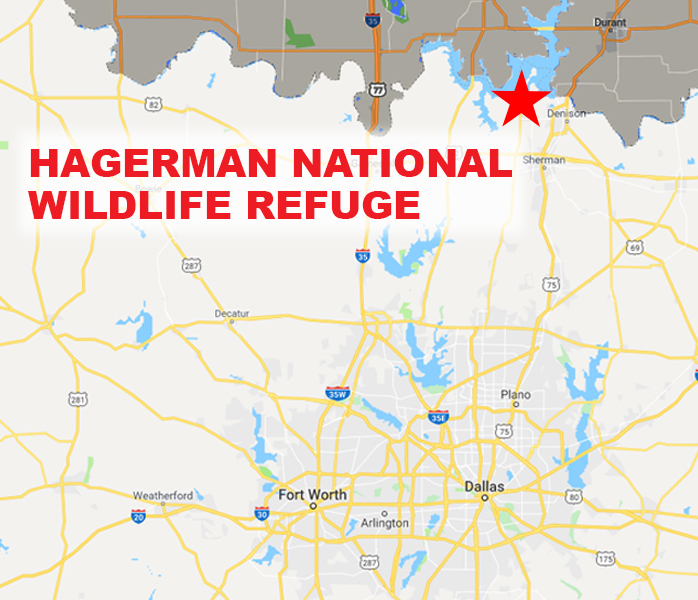 But, the refuge is close enough to be of interest to wildlife-minded folks living in the metroplex. A visit will be a day trip for most people in DFW, even those coming from as far away as south of Fort Worth. As Ron and I wrapped up, I left Hagerman intrigued and determined to return soon. All I would need is a good excuse to come back. Fortunately, it didn’t take long for one to materialize. This past weekend I had occasion to visit Sherman, Texas—the County Seat of Grayson County. Sherman proper is just a few miles from Hagerman, so this would be an opportunity that would be hard to pass up. After I completed my business Saturday afternoon, I decided to get a hotel room and spend the night. That way I could get an early start exploring the park the next morning. I only had a few hours on Sunday that I could spend at Hagerman, and I wanted to make the most of the time. My plan was to select an intriguing trail—one following habitat and terrain that would facilitate many wildlife observations. There were many to choose from. The trail I picked promised a six mile hike round trip. 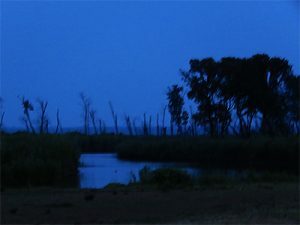 I arrived at the refuge early the next morning—just before first light. My first wildlife sighting occurred as I passed through the front entrance, when a Gray Fox dashed across the road in front of me. This, I thought, was a good omen. After parking at the trailhead, I set off down the path as the sky was beginning to glow softly behind me. The gravel covered trail crunched loudly underfoot. It would be difficult under these noisy conditions to have many—if any—wildlife close encounters. Still, I was hopeful that with a cautious and deliberate hike, I might spot a few critters before they spotted me. The moon over Hagerman, a Great Blue Heron getting an early start, and the first blush of sunrise. It didn’t take long before I had my first notable wildlife observation on the trail. As I was hiking past a small lake, I caught a glimpse of a dark shape moving slowly through the dense vegetation on the opposite bank. I couldn’t quite make out what this animal was—obscured by tall grass as it was—but I had my suspicions. There he is behind the trees… Do you see him? Fortunately, this critter was slowly making its way around the lake toward the trail side. With just a little patience on my part, it seemed pretty certain that the beast would eventually emerge from the vegetation as it cut across the trail. At that moment the critter would be fully exposed—at least temporarily. With a little luck I would have the chance to take a few nice pictures. I positioned myself on the trail near where I believe the animal would emerge. While I waited, I noted Pileated Woodpeckers drumming on tree trunks and making their signature jungle bird call in the woods behind me. These large crow-sized woodpeckers are not often seen in North Texas, and I was very tempted to divert my focus to them. Conflicted, I crossed my fingers and hoped to have a chance to pursue photographing a Pileated later in the morning. In the meanwhile, I would hold my ground. The beast in the brush emerged on to the trail just a few minutes later. 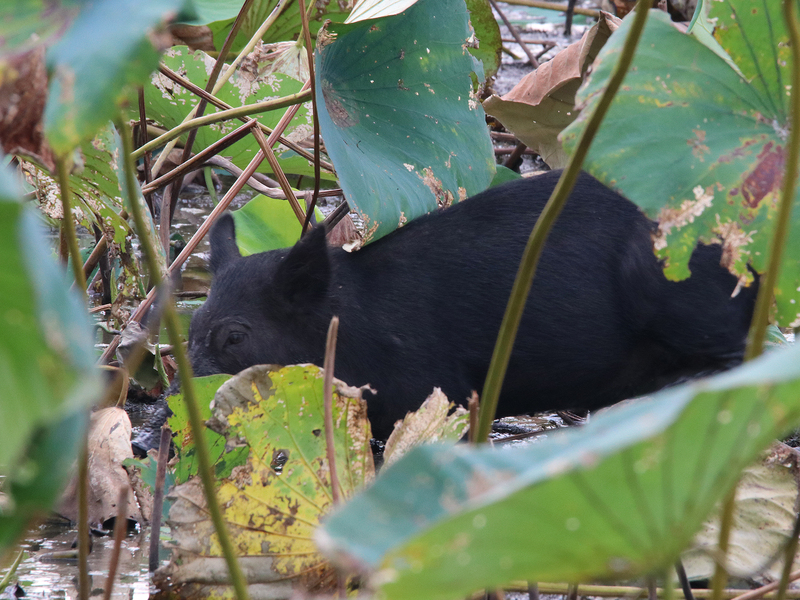 This young black boar crashed noisily out of the tall grass and onto the gravel path, where he stopped for a moment to get his bearings. He was less than a dozen yards from me as I started to take pictures. The first of many Feral Hogs I would observe at Hagerman on this morning. When the hog began moving again, I noticed that he was injured and limping. I could not discern the exact nature of the wound, but it was causing the hog to favor his front right hoof. 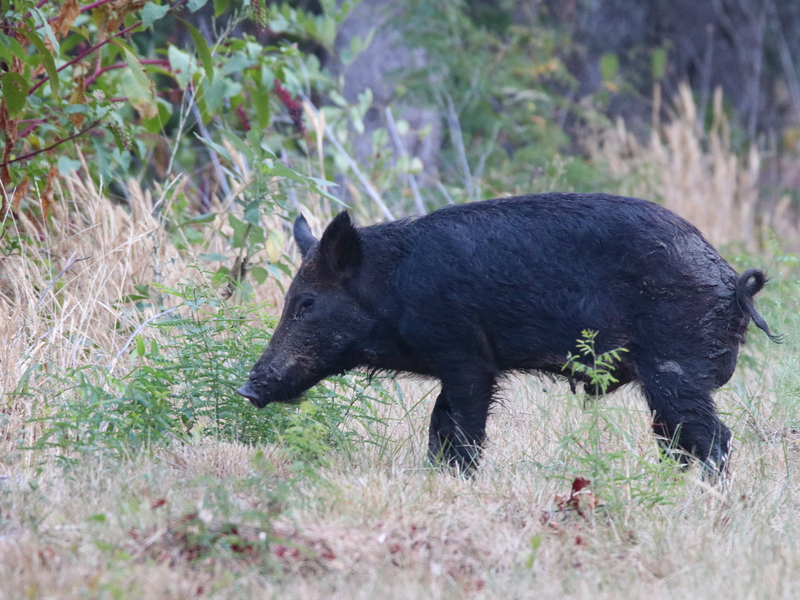 The Feral Hog trundled across the open trail and began looking for a place to re-enter the woods on the far side. It appeared to me that he was looking for a way in that would not challenge his injury. It took him a minute to find one, and when he did the woods swallowed him up without hesitation. 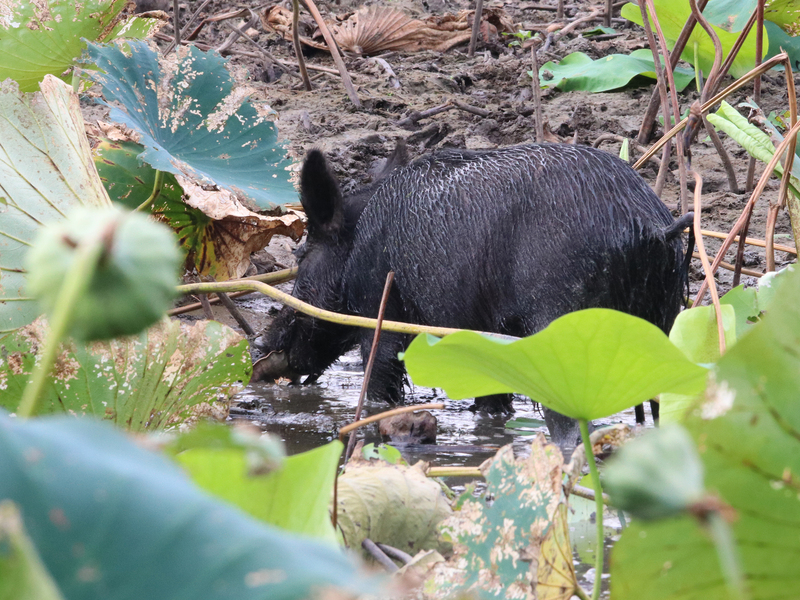 The Feral Hog was quickly gone from sight—though I could still hear him tromping around in the underbrush for some time afterwards. Through it all, I don’t believe the pig ever noticed me—Feral Hogs simply have poor situational awareness at times. The rest of the morning went much the same. I never did find one of the Pileated Woodpecker to photograph, though I did hear few more from time to time as I continued along the way. 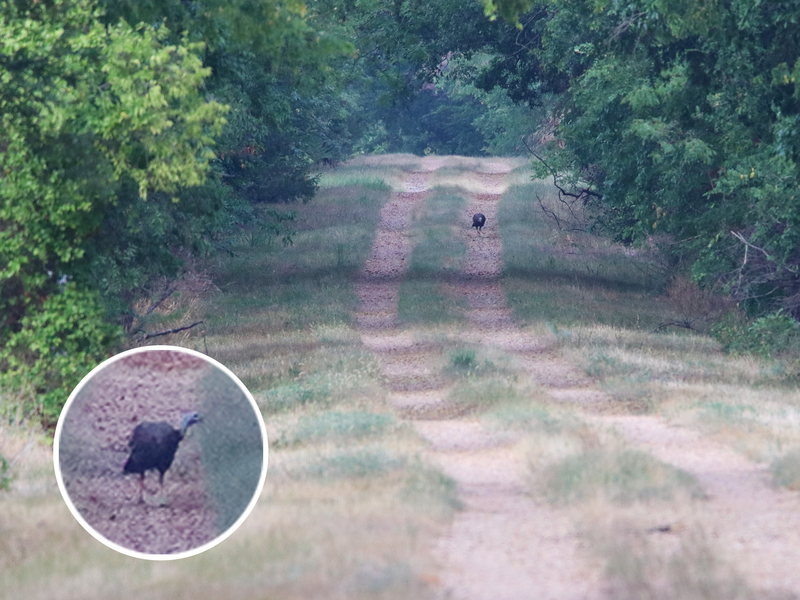 Instead I encountered a number of White-tailed Deer, a few Wild Turkeys, several more Feral Hogs, and many other species of more commonly observed wildlife. The refuge’s residents were out in force this morning. 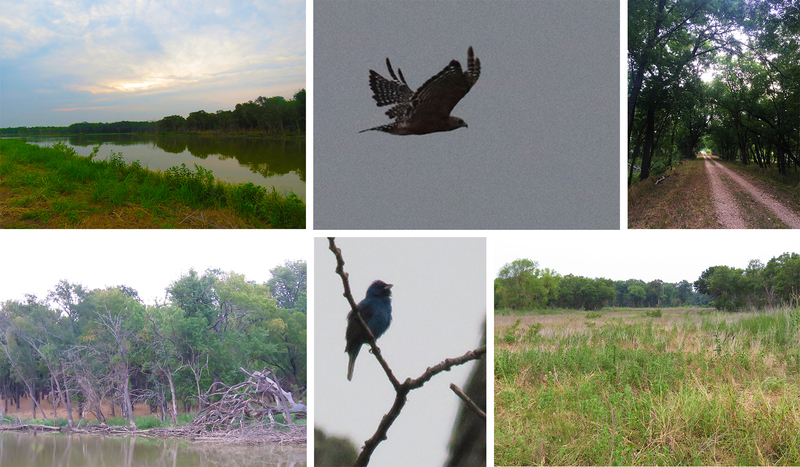 The look of Hagerman… including a Red-shouldered Hawk and singing Indigo Bunting. 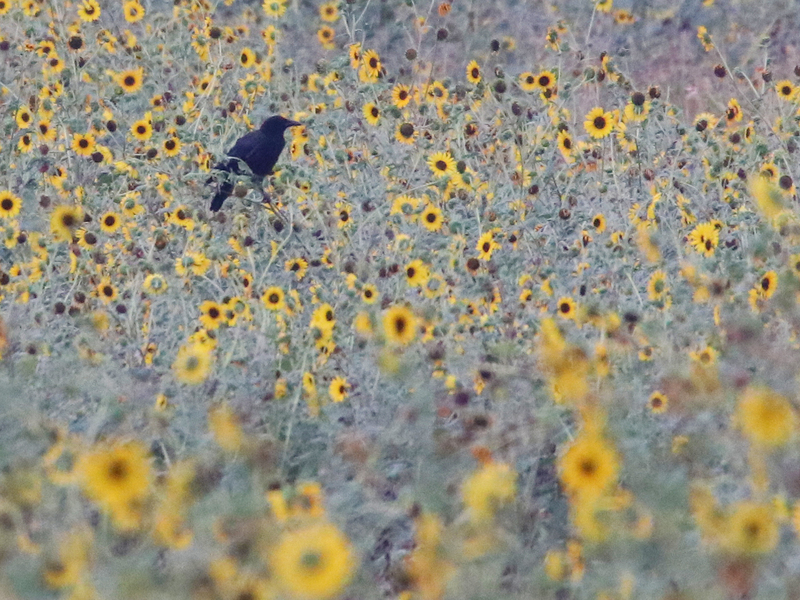 An American Crow in a field of sunflowers. 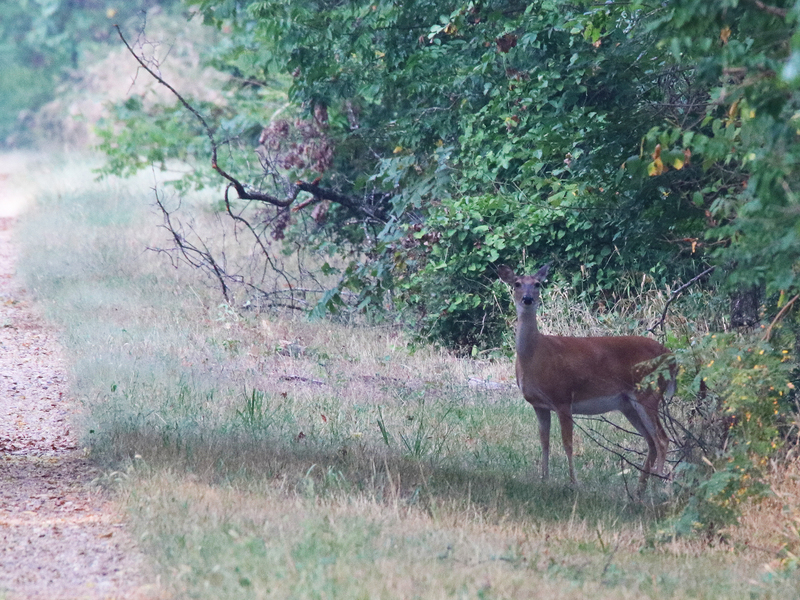 The first White-tailed Deer of the morning… There would be more. 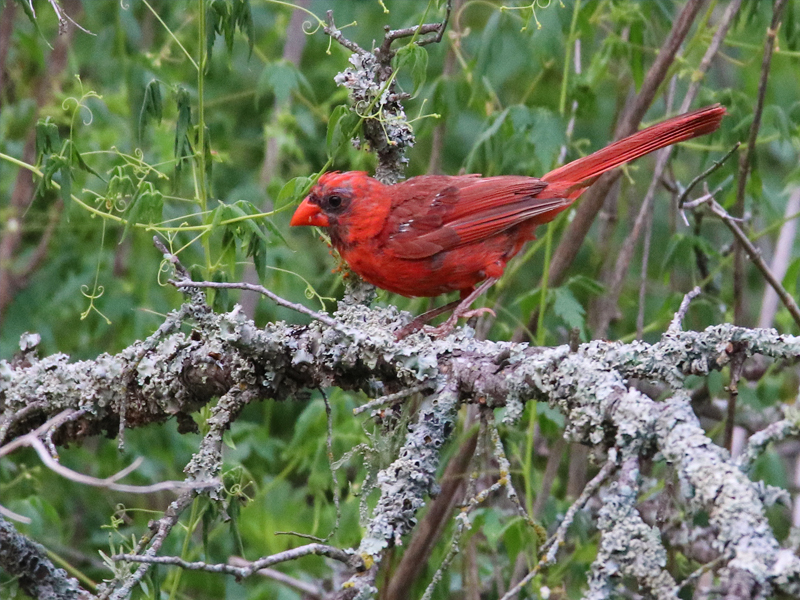 Northern Cardinals—in various stages of molt—were abundant all along the trail. 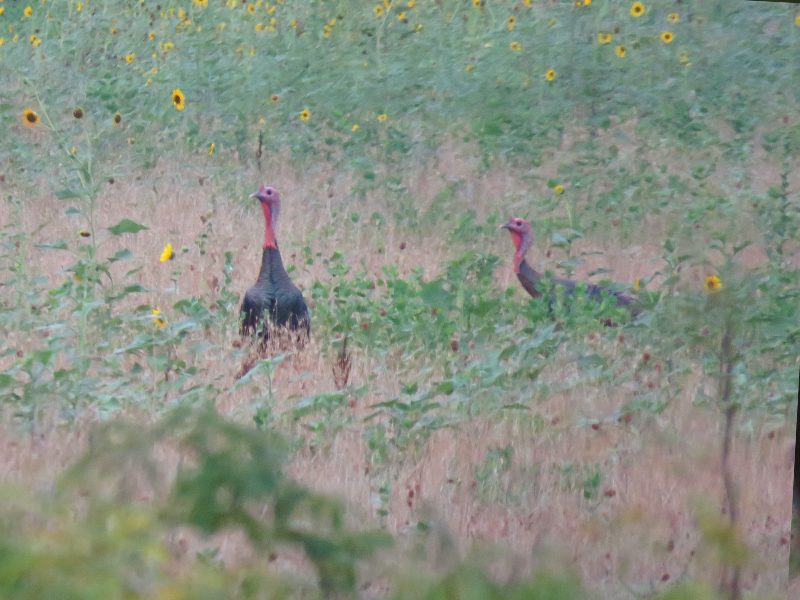 Wild Turkeys foraging in a field. A Wild Turkey up ahead of me on the trail. 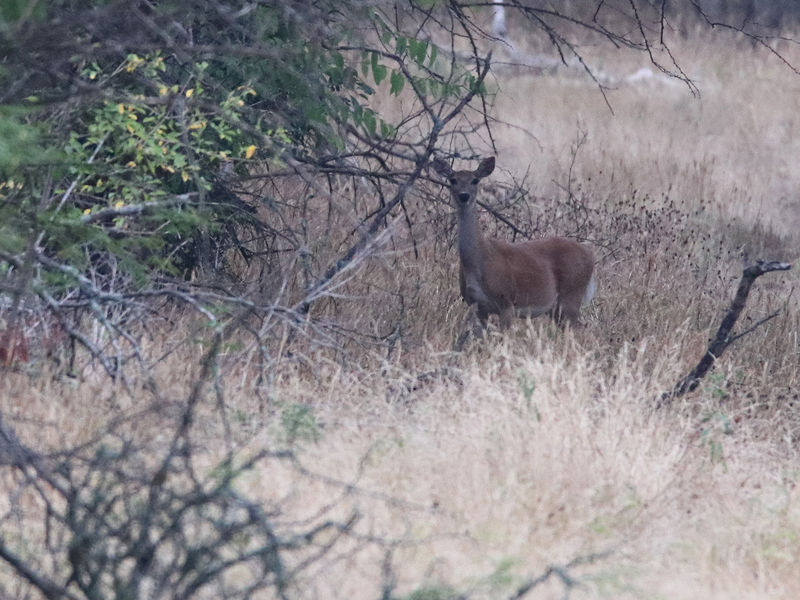 Following closely behind the turkey was this pretty White-tailed Deer doe. 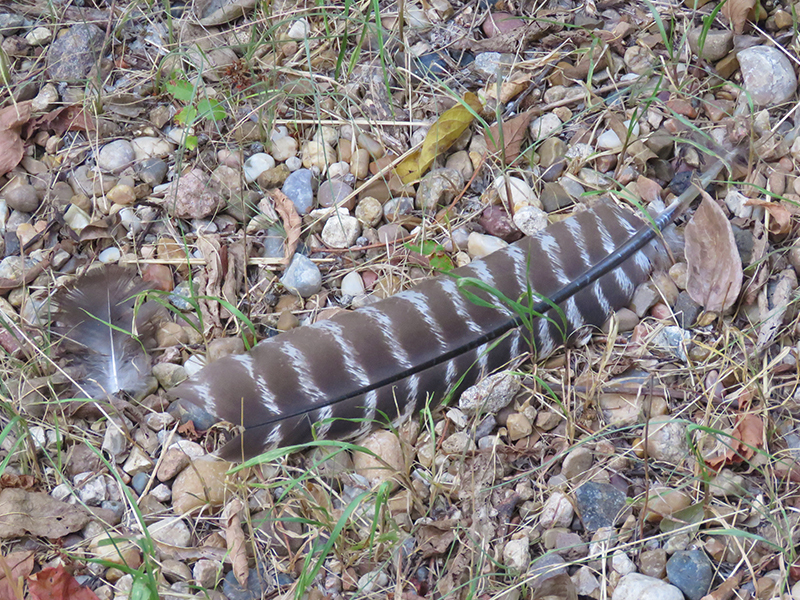 Wild Turkey feathers on the trail. As the end of the trail neared, I encountered this incredible small lake. 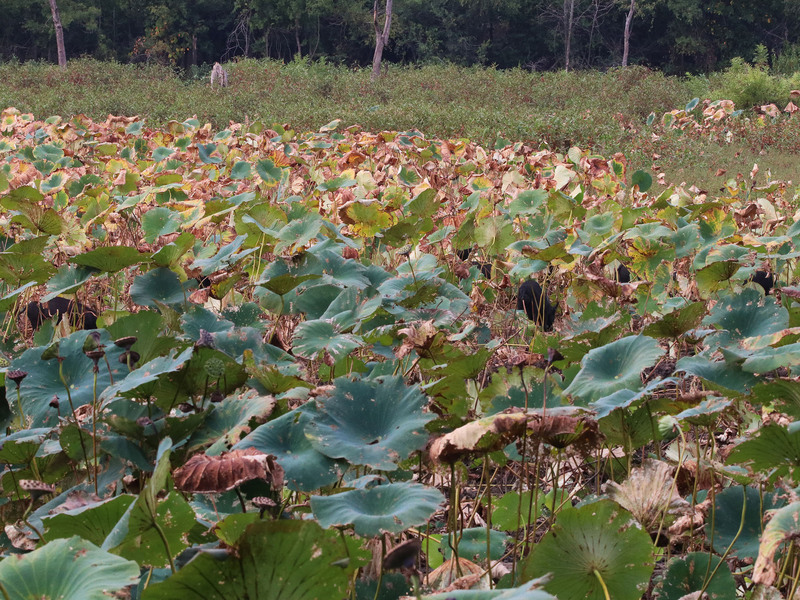 Fifty some acres of water, covered in its entirety, by an expansive field of American Lotus. What a sight this was! And, just as might be expected, the wildlife was abundant at this location as well. Meadow Pond covered in American Lotus. 180 degrees of lake—A Hagerman Half-Circle. Click to enlarge! 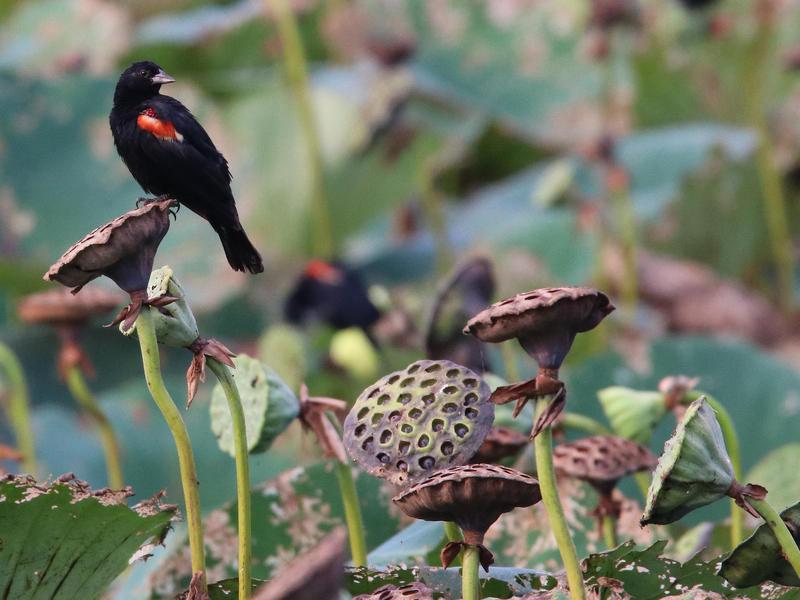 Red-winged Blackbirds frequented this lake by the hundreds. 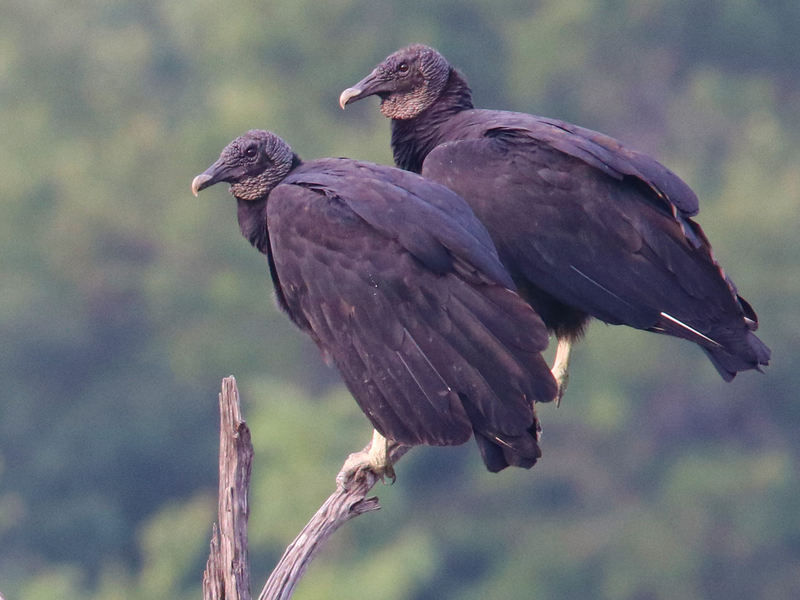 Black Vultures keeping an eye on things. Can you see them? 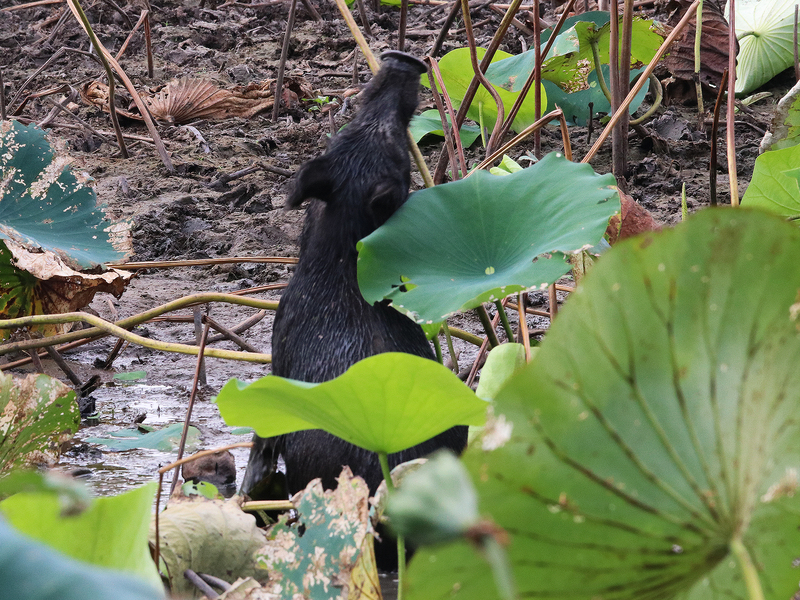 Feral Hogs foraging the pond bottom under a canopy of lotus leaves. Lotus seedpods were on the menu. The hogs relished them! This guy heard me approach, and was trying to catch my scent. 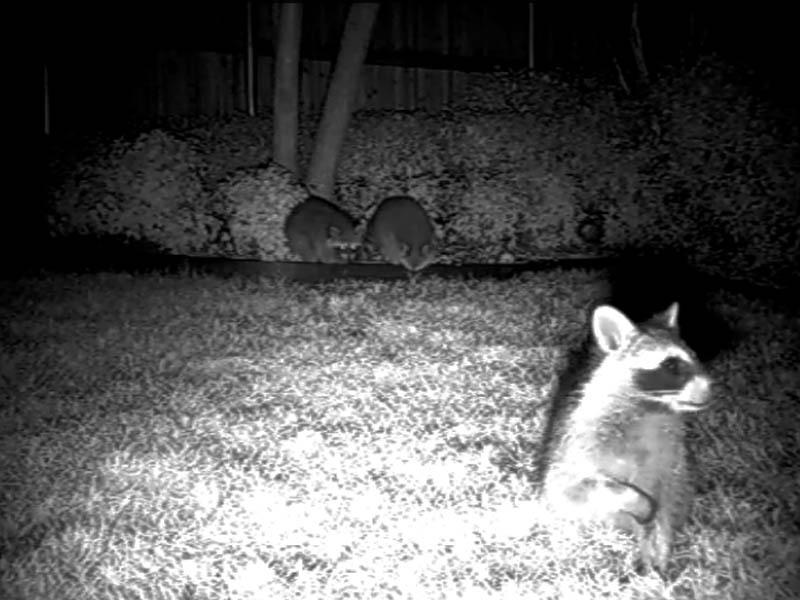 He quickly went back to foraging. There were over a dozen hogs in this sounder. All relatively young and solid black in color—just like this one. 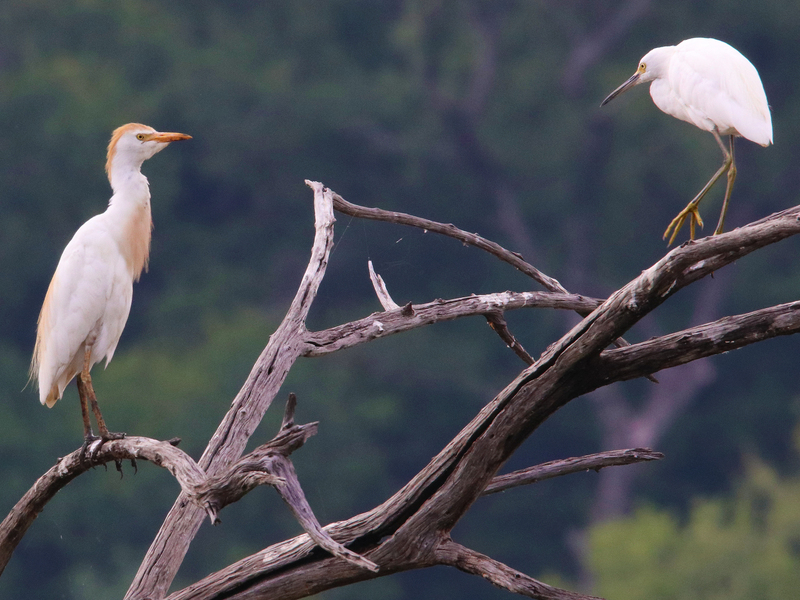 A Cattle Egret and Snowy Egret sharing a perch. 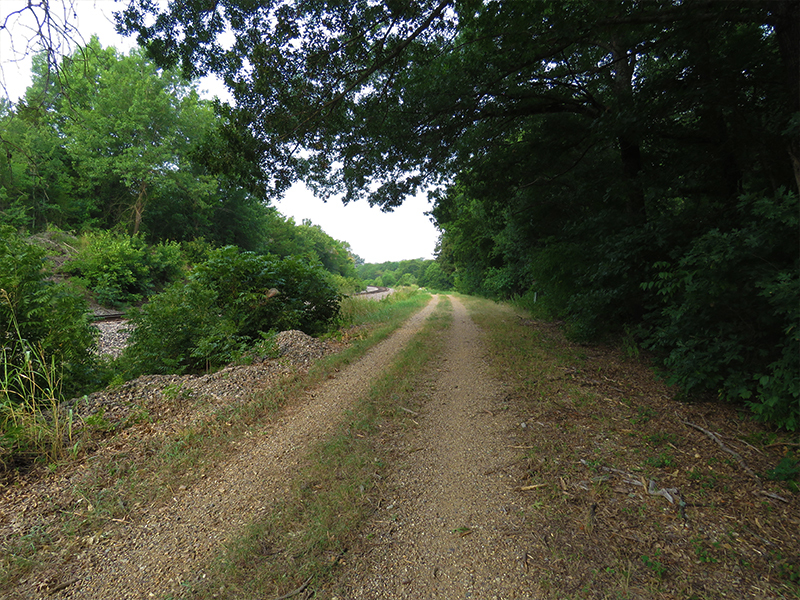 The trail terminated near a remote set of train tracks. 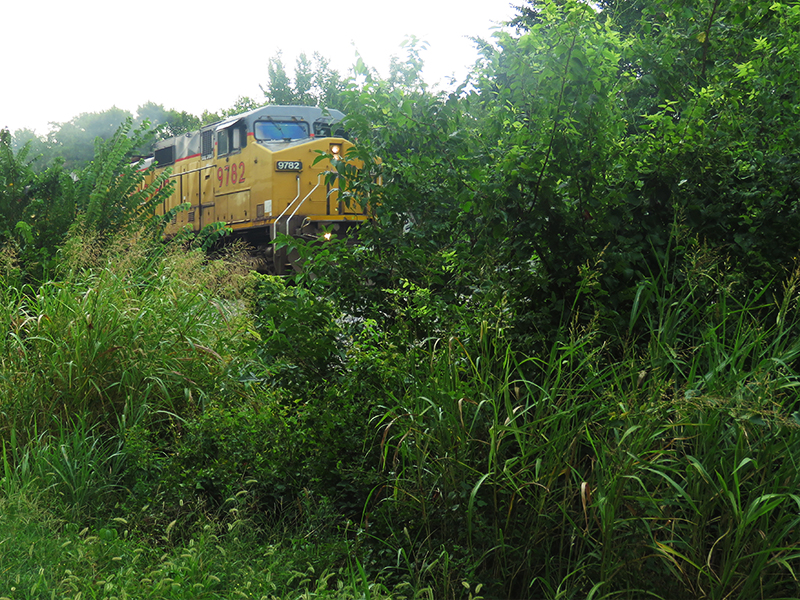 I arrived just in time to see a big locomotive storm by—bound, determined, and full of bluster. The sights train engineers get to see as they cross the countryside must be regularly spectacular! Nearing the end. Time to head back! The biggest beast in the forest! For the first three and a half hours of my hike, I largely had this part of Hagerman all to myself. That’s one of the benefits of getting an early start. Around 9:30 or so I started encountering other park visitors. By this time I was making my way out on my return trip—noting again all of the distinctive land marks I had passed on the hike in. 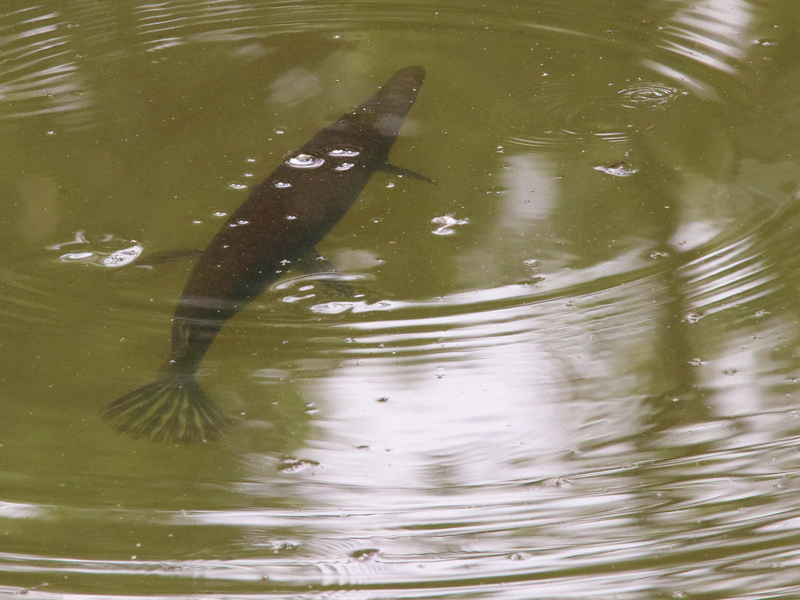 An Alligator Gar in a tributary of Deaver Creek. During the last hour or so, I noticed the sky growing ever darker to the north. Occasionally, I heard the grumble of distant thunder. A storm was brewing. I would be wrapping up my long hike in just the nick of time. A Bald Eagle at Hagerman. 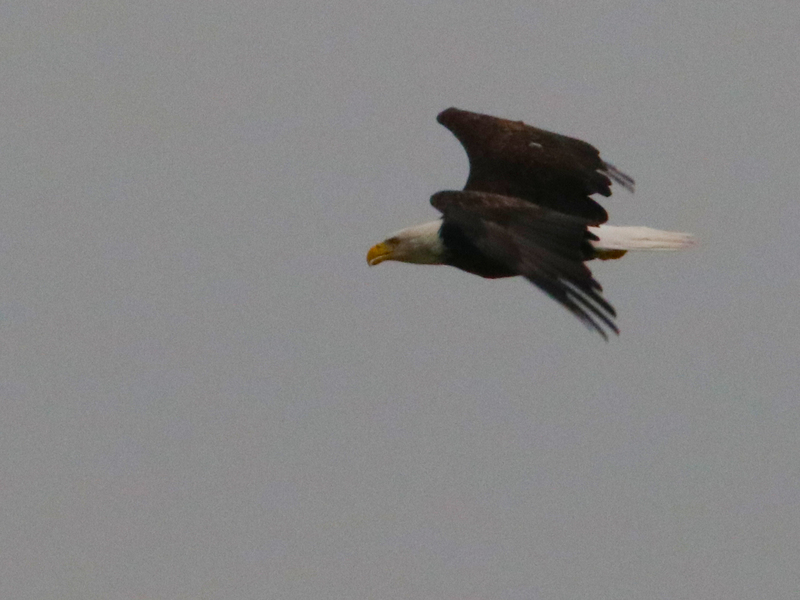 I finished up the morning with a nice sighting of a Bald Eagle. 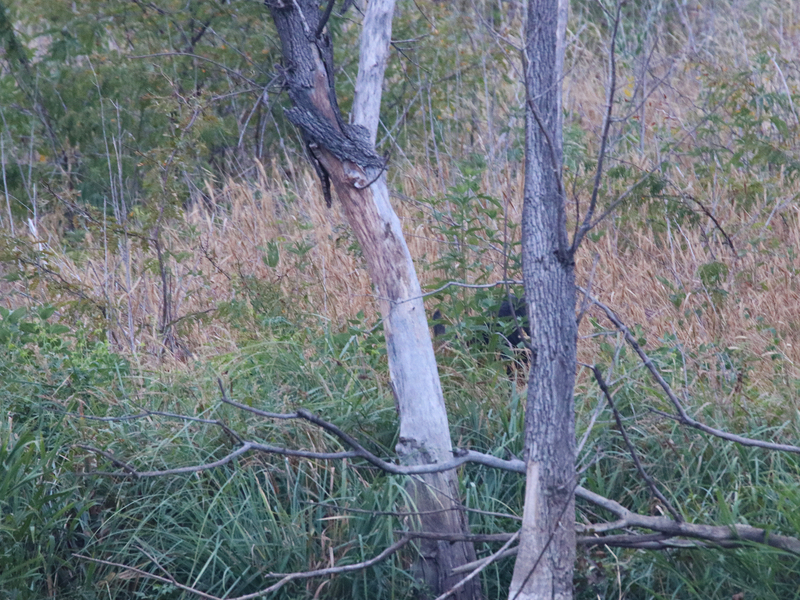 The big bird of prey was stationed on a dead tree overlooking the same small lake where I had spotted the injured Feral Hog earlier in the day. 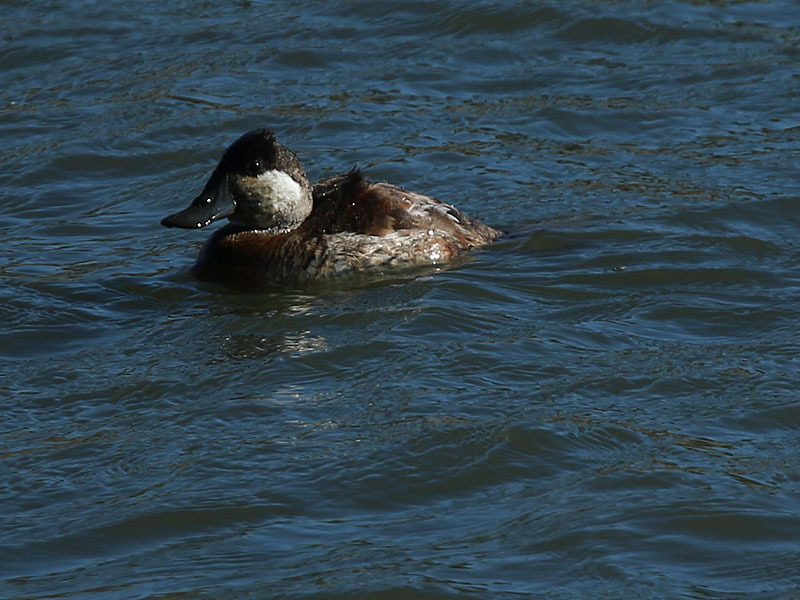 I’m still learning about the behaviors of these rare-in-North-Texas birds, and it was interesting to see this one on a relatively small body of water. 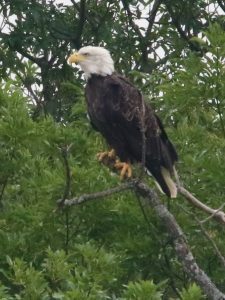 All of my previous Bald Eagle sightings had occurred along the Trinity River or on one of the metroplex’s large reservoirs. This sighting allows for some new possibilities to be considered when it comes to Bald Eagles in the metroplex, and it was a great way to wrap up this particular trip to Hagerman. The bald eagle’s natural range covers most of North America, including most of Canada, all of the continental United States, and northern Mexico. It is the only sea eagle endemic to North America. 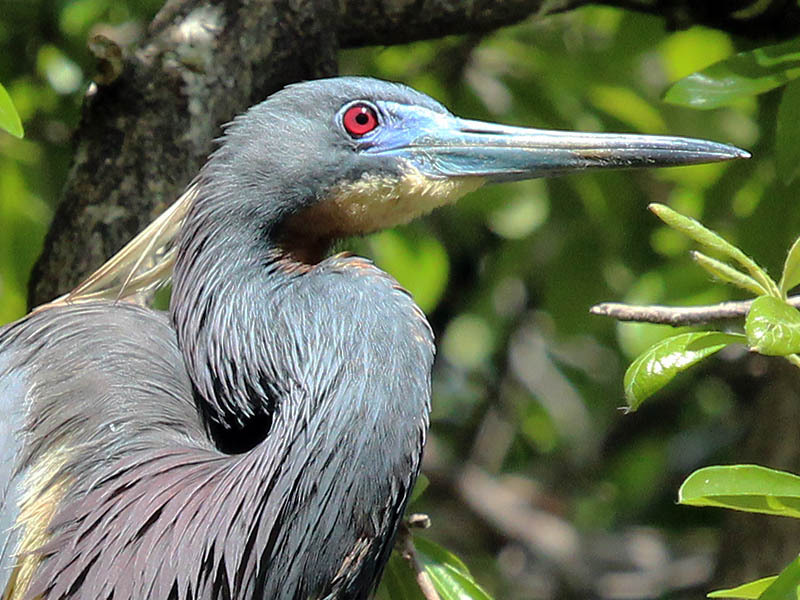 Occupying varied habitats from the bayous of Louisiana to the Sonoran Desert and the eastern deciduous forests of Quebec and New England, northern birds are migratory, while southern birds are resident, remaining on their breeding territory all year. At minimum population, in the 1950s, it was largely restricted to Alaska, the Aleutian Islands, northern and eastern Canada, and Florida. Today, they are much more common, and nest in every continental state and province in the United States and Canada. The bald eagle is both the national bird and national animal of the United States of America. The bald eagle appears on its seal. In the late 20th century it was on the brink of extirpation in the contiguous United States. Populations have since recovered and the species was removed from the U.S. government’s list of endangered species on July 12, 1995 and transferred to the list of threatened species. It was removed from the List of Endangered and Threatened Wildlife in the Lower 48 States on June 28, 2007. A marauding group of American Crows sent the Bald Eagle on his way. I reached my car just as the sky opened up. I was hot and tired, and didn’t mind the cool, refreshing rain one bit. 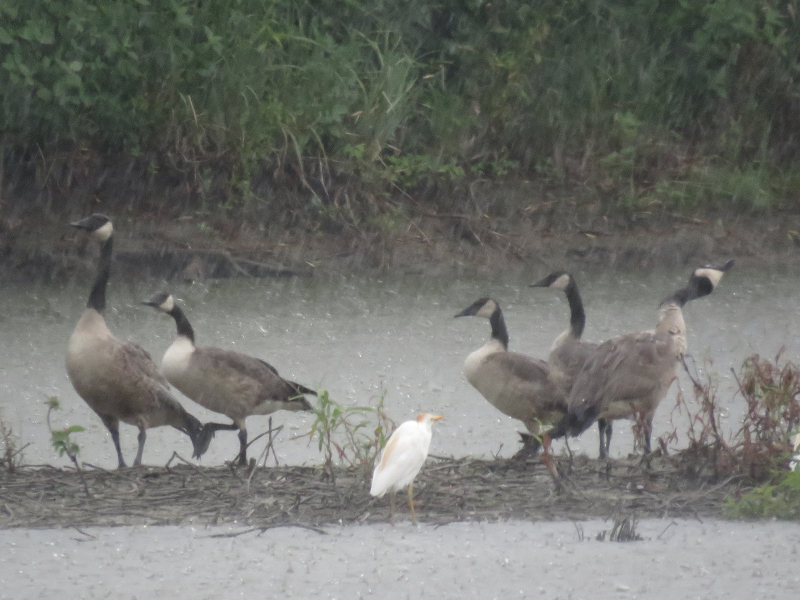 As drove out, I was pleased to have the opportunity to experience the refuge in a downpour. Beautiful in its own right, the rain on the lake and park was really something to see! Enjoying the cool, refreshing rain at Hagerman. I enjoyed reading about your trip to Hagerman. I’ve only recently discovered the Refuge and I really enjoy the place and the abundant wildlife. I wish there were opportunities to participate in group photo walks at the refuge and other areas in the DFW metroplex. What beautiful photos and accompanying diary entries! Really enjoyed reading it. Chris, you put life into your photo adventures. Like Ron, I enjoyed reading about your morning at HNWR. I look forward to seeing you more and perhaps learning from you. Chris, Hagerman NWR has been a favorite destination of mine for many years. Like you, I live in the DFW Metroplex and really enjoyed you talk at our Photo Club meeting. I’m glad that you were able to come back to Hagerman for a special hike down the Meadow Pond trail. Your blog captures the special feel and serenity you can find when you take time to explore the many wonders it has to offer. I hope others from DFW area will make time to visit Hagerman and possibly join the Photo Club. Thanks for sharing with fellow urban dwellers like myself.